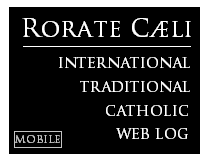 The end of May will see a number of lectures and Latin liturgies of interest to tradition-loving Catholics in the cities of Ottawa and Winnipeg. 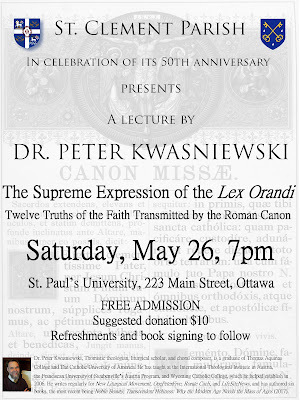 In celebration of its 50th anniversary, St. Clement Parish presents a lecture by Dr. Peter Kwasniewski: “The Supreme Expression of the Lex Orandi: Twelve Truths of the Faith Transmitted by the Roman Canon.” In this lecture, Dr. Kwasniewski will discuss the rich theological content and awesome reverence towards of the sole Eucharistic prayer used in the Roman Rite of the Church for nearly 1,400 years, with its roots going back even further, as well as the problems implicit in having abandoned this tradition in favor of a multiplicity of anaphoras. The lecture will take place on Saturday, May 26, at 7:00 pm, at St. Paul’s University, 223 Main Street, Ottawa. Free admission (suggested donation $10). Refreshments and book signing with the lecturer to follow. The Society of St. Dominic will be honouring Most Rev. 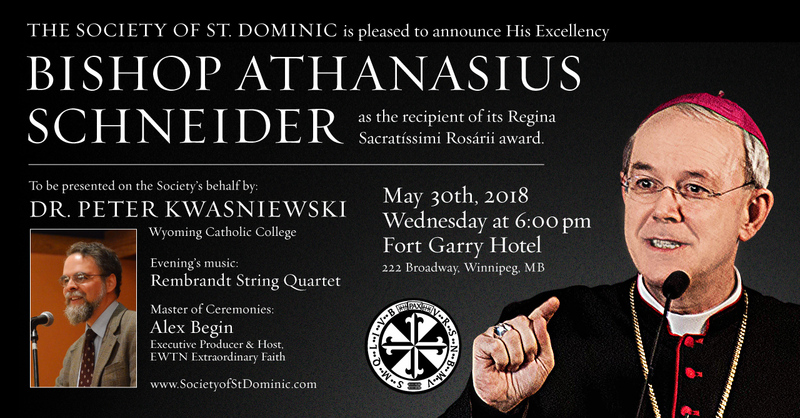 Athanasius Schneider, Auxiliary Bishop of the Archdiocese of St. Mary in Astana, Kazakhstan, with the Regina Sacratissimi Rosarii award at the Fort Garry Hotel on Wednesday, May 30th, 2018. His Excellency will deliver an address. The Society has commissioned New York iconographer Mr. Ken Woo to create the inaugural award, which will be presented by Dr. Peter Kwasniewski. The Master of Ceremonies for the evening will be Mr. Alex Begin, Executive Producer and Host of EWTN’s Extraordinary Faith. Music for the evening will be provided by the Rembrandt String Quartet. Tickets are $100 per person, payable by cash or cheque. (To minimize transaction costs, we are not accepting credit card payments.) Cheques should be made payable to the SOCIETY OF ST. DOMINIC. NB: Deadline for registration is May 23rd. 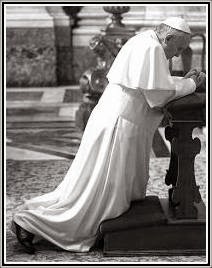 Bishop Schneider will be offering the Holy Sacrifice of the Mass on Wednesday, May 30th, and Thursday, May 31st (Corpus Christi), at 9:30 am each day. On Thursday afternoon, Mr. Begin and Dr. Kwasniewski will be speaking at the Canadian Mennonite University. St Anthony of Padua Church, 250 Burrin Ave.
Canadian Mennonite University, 500 Shaftesbury Blvd. All events are open to the public, except for the Award Dinner which requires preregistration.